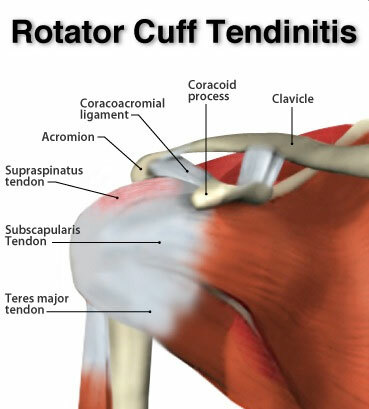 Rotator cuff consists of four specific muscles: the supraspinatus (most commonly injured rotator cuff muscle), infraspinatus, teres minor, and subscapularis muscles. These muscle are used to either laterally (outer) rotation or medially (inner) rotation of the shoulder. 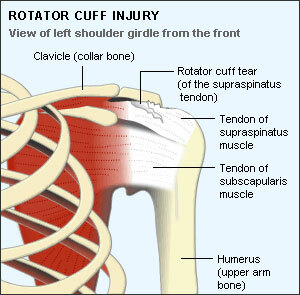 The rotator cuff muscles also help to stabilize the shoulder joint as well. Rotator cuff injuries are common injuries to the shoulder as these muscles are often used to do many tasks whether cleaning, playing sports, jobs that involve the hands/arms such as painters, carpenters, drywallers, plumbers and floor installers. If you have any questions about rotator cuff injuries contact our staff at Dynamic Physiotherapy.